Vinyl Countdown Video Slot Guide & Review - Casino Answers! 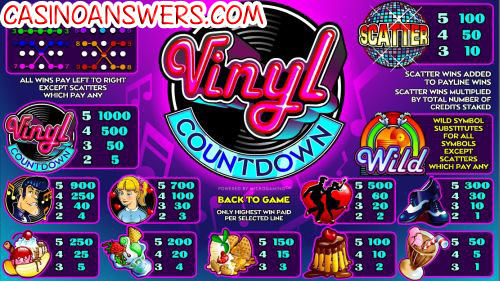 Vinyl Countdown is a 5-reel, 9-line video slot developed by Microgaming, featuring wild substitutes and scatter wins. You can play the Vinyl Countdown video slot at Nostalgia Casino and Grand Hotel Casino. 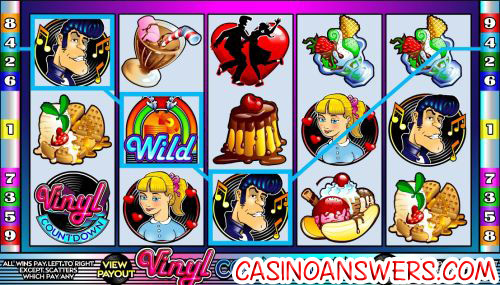 You can bet $0.25, $0.50, $1 or $2 per payline on the Vinyl Countdown slot game. To change the number of paylines you wish to play from the maximum of 9, hit the “Select Lines” button. Hit “Bet Max” to play all 9 lines. Vinyl Countdown only allows for one-coin play, so there is not a large betting range allowed. The lowest total bet you can make on Vinyl Countdown is $0.25 per spin, whereas the highest total bet is $18 per spin. To play the Vinyl Countdown video slot, press the “Spin” button. The top jackpot symbol on the Vinyl Countdown slot machine is the Vinyl Countdown symbol. If 5 of these Vinyl Countdown symbols appear, you will win 1000 coins. 5 Greaser symbols are worth 900 coins and 5 of his girlfriend’s symbol are worth 700 coins. The wild symbol on Vinyl Countdown is the Jukebox symbol. It substitutes for all symbols except for the Glitter Ball scatter symbol. The Jukebox symbol only appears on reels 2, 3 and 4 in Vinyl Countdown. Use the Jukebox symbol to create more winning combinations when playing Vinyl Countdown at Nostalgia Casino. The Glitter Ball scatter symbol will pay 10X your total bet for 3 symbols, 50X for 4 symbols and 100X for 5 symbols. All wins on Vinyl Countdown pay left to right, except for scatter symbols (which pay any). Scatter wins are added to payline wins. Scatter wins are multiplied by the total bet. Only the highest win is paid per selected payline. In Expert Mode, you can hit “5X” or “10X” for quick autoplay spins or open up the advanced settings using the “Autoplay” button. You can play 5, 10, 25, 50, 100, 250 or 500 autoplay spins and set autoplay to stop if a win exceeds or equals $25, $50, $100, $250, $500, $1000 or $2500. You can cancel the autoplay feature at any time. Vinyl Countdown is an outdated and thus underwhelming Microgaming video slot. There are no special features, it has a low top jackpot and it has nothing of any note to offer. On the flip side of the coin, it is an inexpensive video slot to play, so if you are just looking for something simple, you can play it by signing up now at Nostalgia Casino. Are players from the United States able to play the Vinyl Countdown video slot for real money? Unfortunately, players from the United States are unable to play at Microgaming online casinos for real money at this time. For a similar themed classic slot machine that you can play at US-friendly casinos, please read our Malt Shop Memories Classic Slot Review. Where can I play a free Flash game of the Vinyl Countdown slot machine? You can play a Flash game of Vinyl Countdown at Nostalgia Flash Casino and Grand Hotel Flash Casino. You can play for free or play for real money. If you experience issues with the Flash software, try downloading and installing the latest version of Adobe Flash Player. Where can I play the Vinyl Countdown Video Slot Bonus Game?